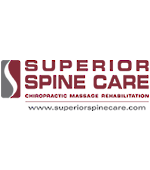 Our goad at Superior Spine Care is to provide you with the best combination of Chiropractic, massage therapy and rehabilitation procedures to help resolve your unique condition as quickly as possible. Whether you are recovering from an injury, dealing with everyday aches and pains, or simply want to improve performance, our clinic offers a variety of treatment options. We strive to help restore your health with a hands on approach. Our patients leave each visit understanding how to feel, move and live better!